In an interview, Shoshana Milgram, Rand's "official" biographer, is asked whether Rand ever read Kant. Given how far Rand's interpretation of Kant departs from the views of actual followers and admirers of Kant, many people have assumed that Rand must never have read Kant. 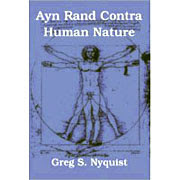 Objectivists tend to regard this assumption as derogatory of Rand and deplore it. But it's not necessarily any worse than the alternative. For if Rand had in fact read Kant and still gotten him so very wrong, that would speak poorly regarding her ability to interpret philosophical texts. So what is worse? Mis-interpreting Kant because of a lack of familiarity with the relevant texts? Or reading Kant with great attentiveness and still getting him wrong?